In this report, we highlight the clinical, electrophysiological, and histopathological findings in a middle-aged man with Tangier disease. A 43-year-old gentleman presented with incomplete eye closure of 4 years duration, associated with labial dysarthria. Over the last 3 years, he had noticed progressive difficulty in gripping objects with either hand, with thinning of forearms, and painless burns over the distal upper extremities. He then developed numbness of the head and face, trunk, and upper limbs since a year. For these symptoms, he was prescribed presumptive anti-Hansen's treatment at another hospital. There was no history of visual or hearing impairment, positive sensory symptoms, or symptoms suggesting dysautonomia. There was no family history of neuropathic illness. Examination showed healed thermal burns over bilateral forearms, bifacial weakness, distal hypotonia, with wasting and weakness of distal upper limbs. There was diminished touch and pin-prick over the scalp, face, trunk, upper limbs, and proximal lower limbs up to mid-thigh reminiscent of a syrinx. Kinesthetic sensations and cerebellar system were intact. Routine investigations including hemogram, erythrocyte sedimentation rate, and hepatic and renal function tests were normal. Autoantibody profile (Euroline ®, immunoblot technique), serum protein electrophoresis, serum angiotensin converting enzyme (ACE) levels (20.1 U/l; ref: 20-70 U/l), human immunodeficiency virus (HIV) antibody test, abdominal ultrasound, audiometry, and other conventional autonomic function tests were found to be within normal limits. Urine examination for porphobilinogen and Bence-Jones protein yielded negative results. Lumbar cerebrospinal fluid (CSF) was normal except for mildly elevated protein (cell count: 0/mm 3 ; protein: 58 mg/dl, ref: 20-40 mg/dl; and glucose: 61 mg/dl, ref: 40-60 mg/dl). 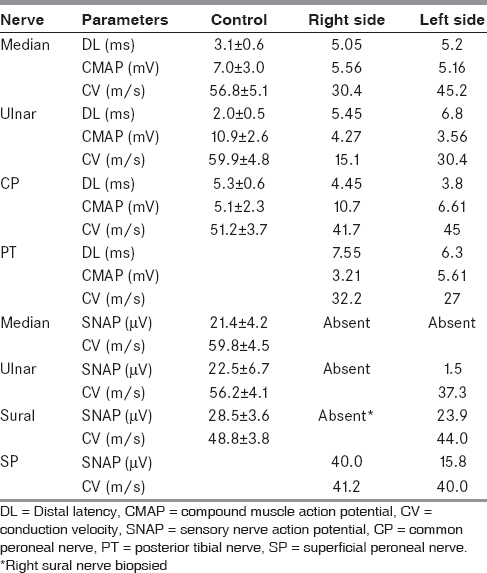 Investigations at our center showed electrophysiological evidence of demyelinating polyneuropathy [Table 1]. Sympathetic skin responses were absent from the upper and lower limbs. The serum lipid profile was abnormal with extremely low levels of HDL (5 mg/dl; ref: 35-65 mg/dl) and elevated TG (185 mg/dl; ref: 50-150 mg/dl); and normal levels of total cholesterol (149 mg/dl; ref: 110-220 mg/dl), very low density lipoprotein (VLDL) (37 mg/dl; ref: 10-40 mg/dl), and LDL (110 mg/dl; ref: 60-160 mg/dl). Serum apolipoprotein A1 was significantly reduced (<5.38 mg/dl; ref: 110-205 mg/dl). His sural nerve had been biopsied elsewhere, this was retrieved and reviewed. It showed mild depletion of small diameter myelinated fibers in small pockets in the periphery of each fascicle. In addition, there was a striking vacuolation of the Schwann cell cytoplasm indenting the nucleus [Figure 1]. Skin biopsy revealed numerous bloated, finely vacuolated fibroblasts throughout the entire thickness of the skin, surrounding the dermal capillaries, nerve twigs, and cutaneous adnexal structures. The vacuolated granular cytoplasm was seen indenting the nucleus [Figure 1]. These vacuoles stained with Oil Red O, confirming the presence of lipid rich material [Figure 1]. Slit lamp examination for corneal fat deposits, Doppler of the neck vessels, and echocardiography revealed normal findings. An unusual pattern of dissociated sensory loss involving the face, trunk, upper limbs, and proximal thighs. The differential diagnoses in a patient with predominant bifacial weakness could be acute and chronic inflammatory demyelinating neuropathies, Lyme's disease, sarcoidosis, HIV infection, porphyria, Hansen's disease, Gelsolin familial amyloid neuropathy, Tangier's disease, and vasculitis such as Sjogren syndrome. The combination of facial diplegia and predominant involvement of upper limbs is the characteristic clinical phenotype; this coupled with the typical lipid profile and nerve biopsy observations clinched the diagnosis of Tangier disease. Yet, several cases are misdiagnosed as leprosy or other immune mediated neuropathies, including the above patient. Apart from the Schwann cells, abnormal lipids also accumulate in several tissues including tonsils, liver, spleen, lymph nodes, thymus, gastrointestinal mucosa, bone marrow, and fibroblasts of the skin in Tangier disease. Cutaneous deposition of cholesterol esters has been demonstrated in clinically uninvolved skin in patients with Tangier disease. Thus, skin biopsy is a valuable tool for diagnosis; it may also serve as a model for further research into the pathogenesis, development of newer drugs, and follow-up of patients with this rare disorder. Patients presenting with clinical features of polyneuropathy or mononeuritis multiplex are likely to undergo skin biopsy as a part of diagnostic evaluation for vasculitis, leprosy, sarcoidosis, and amyloidosis. The presence of lipid accumulation in these peripheral tissues should be looked for in addition to the above differential diagnosis. Subsequently, a simple biochemical test in the form of serum lipid profile clinches the diagnosis. In conclusion, the presence of a demyelinating electrophysiology in a patient with predominant upper limb involvement and facial diplegia should raise the suspicion of Tangier's disease. Simple biochemical tests in the form of estimation of serum lipids should form a part of routine evaluation in these patients in order to avoid misdiagnosis. This will in turn avoid misdiagnosis and institution of inappropriate therapy. Rust S, Roiser M, Funke H, Real J, Amoura Z, Piette JC, et al. Tangier disease is caused by mutations in the gene encoding ATP-binding cassette transporter 1. Nat Genet 1999;22:352-5. Puntoni M, Sbrana F, Bigazzi F, Sampietro T. Tangier disease: Epidemiology, pathophysiology, and management. Am J Cardiovasc Drugs 2012;12:303-11. Assman G, von Eckardstein A, Brewer HB. Familial analphalipoproteinemia: Tangier disease. In: Scriver CR, Beauder AL, Sly WS, editors. The Metabolic and Molecular Bases of Inherited Disease. New York: McGraw-Hill Co; 2001. p. 2937-53. Theaudin M, Couvert P, Fournier E, Bouige D, Bruckert E, Perrotte P, et al. Lewis-Sumner syndrome and Tangier disease. Arch Neurol 2008;65:968-70. Sinha S, Mahadevan A, Lokesh L, Ashraf V, Chandrasekhar Sagar BK, Taly AB, et al. Tangier disease- a diagnostic challenge in countries endemic for leprosy. J Neurol Neurosurg Psychiatry 2004;75:301-4. Cai Z, Blumbergs PC, Cash K, Rice PJ, Manavis J, Swift J, et al. Paranodal pathology in Tangier disease with remitting-relapsing multifocal neuropathy. J Clin Neurosci 2006;13:492-7. Marbini A, Gemignani F, Ferrarini G, Maccari S, Lucci B, Bragaglia MM, et al. Tangier disease: A case with sensorimotor distal polyneuropathy and lipid accumulation in striated muscle and vasa nervorum. Acta Neuropathol 1985;67:121-7. Waldorf DS, Levy RI, Fredrickson DS. Cutaneous cholesterol ester deposition in Tangier disease. Arch Dermatol 1967;95:161-5. Joy T, Wang J, Hahn A, Hegele RA. 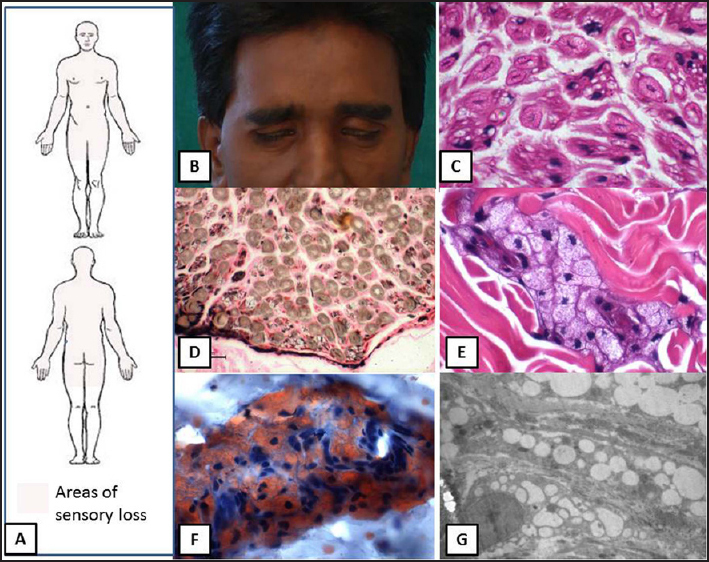 APOA1 related amyloidosis: A case report and literature review. Clin Biochem 2003;36:641-5. Goldiner I, van der Velde AE, Vandenberghe KE, van Wijland MA, Halpern Z, Gilat T, et al. ABCA1-dependent but apoA-I-independent cholesterol efflux mediated by fatty acid-bile acid conjugates (FABACs). Biochem J 2006;396:529-36.